Hamburg was one of Germany's main musical centres in the 17th century. This was the result of excellent musicians working in the city, both in the church and in the opera. The three musicians who played a central role in church music were the organist Heinrich Scheidemann, the violinist Johann Schop and the Musikdirektor Thomas Selle. The organ works of Scheidemann are relatively well represented on disc, but so far the compositions of the other two are hardly explored. Therefore this disc devoted to sacred works of Selle is most welcome. Selle's early years are relatively poorly documented. He was born in Zörbig in Saxonia, and probably went to the Thomasschule in Leipzig, and then to the university. It is likely he was acquainted with or even a pupil of Sethus Calvisius, choirmaster of the Thomasschule, and his successor Johann Hermann Schein. From 1624 to 1641 he held several positions in the duchy of Schleswig-Holstein-Gottorf. The position of church and city music director in Hamburg was a prestigious one, and the fact that he was appointed as such is an indication of his reputation. This is confirmed by the praise of the senior of the local pastorate, calling him "a man who is very learned and excellently versed in the Muses". Selle had a decisive influence on the performing conditions in the churches in Hamburg. The local town musicians were included in performances of liturgical music and additional musicians were hired. Selle also made sure more singers were available, some of whom were from outside the church. The increase in size and quality of the vocal and instrumental ensemble gave him the opportunity to perform technically demanding music with large ensembles, something he seems to have preferred. In the preface to a collection of music of 1627 Selle shows his dislike of small forces. It therefore comes as no surprise that several pieces for two to five choirs figure on this disc. The main work is the Historia der Auferstehung, which is set for 8 and 14 voices with basso continuo. The text is based on a gospel harmony published by Johannes Bugenhagen in 1526 which was also the basis for the Auferstehungshistorie of Heinrich Schütz. One of the remarkable aspects of this work is that it is almost twice as long as Schütz's, because it also contains the story about the apostle Thomas and Jesus' Ascension. Unfortunately this part of the work has been left out. After the passage where Jesus sends his apostles to spread his message we hear the Conclusio: "Now thank we all God, who has given us the victory through our Lord Jesus Christ. Amen." There was enough space on the disc to perform the whole work, but evidently Manfred Cordes preferred to present only the first part, in order to have space for other compositions for Easter. But this is a live recording, so the requirements of a concert could also explain this decision. It is regrettable nevertheless as it is doubtful whether we will ever get the opportunity to hear the work complete. It is an interesting and expressive piece. The role of the Evangelist is sung by a tenor, who is supported by bass viols and bc. The words of Jesus are accompanied by two violins and bc. There is a strong connection between text and music, and Selle misses no opportunity to translate dramatic moments into his music. This is well explored in the performance: the ensemble is excellent, and in particular the interpretation of the role of the Evangelist deserves much praise. The singer of this part isn't mentioned, but I assume it is Julian Podger. Wolf-Matthias Friedrich is no less impressive in his performance of the role of Jesus. As in Hamburg Selle had a considerable number of musicians at his disposal he adapted some earlier works by extending the scoring. For instance, the first piece in the programme, A Domino factum est illud, was originally scored for alto, two tenors, bass and bc, but in Hamburg Selle added two soprano parts, which resulted in a six-part chorus. In order to enrich the ritornellos and the newly-created sinfonia he added two four-part instrumental groups, which are played here by strings and wind respectively. And again we find some good text expression, in particular as a change of rhythm is used to express the joy in the last line: "let us rejoice and be glad in it". The hymns which were an important part of church music in the 17th century frequently appear in Selle's compositions. They are often the subject of chorale variations. Selle arranges them in various ways as the pieces on this disc show. Unfortunately these are also mostly performed incomplete: from Christ lag in Todesbanden we only get verses 1, 2, 5 and 6, and of the 10 verses of Jesus Christus, unser Heiland we hear only the first four. 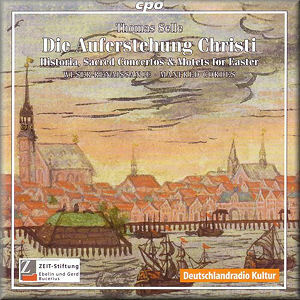 Christ ist erstanden is another well-known hymn which is used by Selle for a chorale concerto. The sinfonia contains a virtuoso violin part, and it is reasonable to assume that this part was intended to be played by Johann Schop, one of North-Germany's most famous violinists. One of the smallest-scored pieces on the programme is Erstanden ist der Herre Christ for tenor and three instruments, which dates from an earlier period in Selle's career. Ich weiß, daß mein Erlöser lebt is also assumed to be written before his time in Hamburg. It is written in motet-style and set for eight voices in a high and a low choir. In the programme notes Jürgen Neubacher refers to the fact that Selle owned many collections of music by Lassus, showing his great interest in counterpoint. The sacred works by Selle on this disc are performed with one voice per part, and that reflects what was common practice in his time. In the large-scale pieces instruments are usually added to play colla parte with the voices. Weser-Renaissance is an ensemble with a long and thorough experience in German music of the 17th century. All singers know this kind of repertoire, and that includes the British tenor Julian Podger, who received part of his musical education in Germany. The performances are technically immaculate, both vocally and instrumentally, and display a great amount of text expression. In addition the rhythmic flexibility of the ensemble and the dynamic contrasts as well as the sensible instrumental scoring help to communicate the splendour of this repertoire. This disc bears witness to the quality of Selle's sacred music and gives some idea about the level of music-making in Hamburg in the 17th century. Let's hope more of this repertoire is going to be explored.